Belships operating income in 3rd quarter 2018 was USD 8.3 million (Q2: USD 8.3 million), while EBITDA amounted to USD 3.2 million (USD 3.5 million). The Group's operating result amounted to USD 1.8 million (USD 2.1 million), while net result for 3rd quarter 2018 was USD 0.6 million (USD 0.9 million). 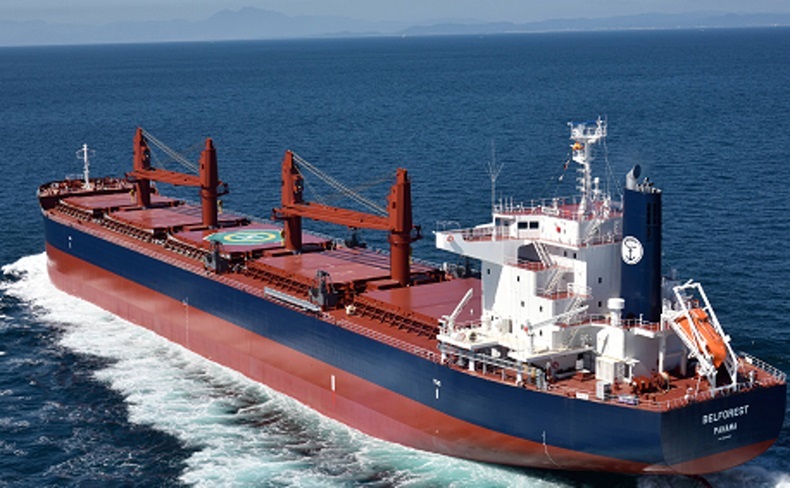 Belships concentrates on the dry bulk market, with 6 modern Supramax/Ultramax in service. M/V Belstar, M/V Belnor and M/V Belisland have continued the long-term contracts to Canpotex of Canada. Canpotex is one of the world's largest exporters of potash, a fertilizer product imported in large volumes by countries such as China, India and Brazil. M/V Belforest, M/V Belocean and M/V Belnippon are all on time charter to Cargill. In September the c/p's with Cargill for M/V Belforest and M/V Belocean were extended until August and October 2019 at USD 13,500 and USD 12,000 daily respectively. Next open position will then be M/V Belnippon in February 2019. All ships have sailed without significant off-hire. Technical management is handled by Belships Management (Singapore), with a total fleet of 10 ships under technical management. Belships' remaining newbuilding program with Imabari Shipbuilding in Japan consists of one 63 000 dwt eco-design Ultramax bulk carrier on a long-term T/C-in agreement incl. purchase option for delivery within first half 2020. As per 30 September the Group's cash totaled USD 5.3 million, which is unchanged from 30 June. The mortgage debt as per 30 September was USD 24.5 million. Net lease obligation as at 30 June was USD 41.2 million. In addition Belships has a long-term loan facility of SGD 2 million, secured by the lease agreement for our Singapore office. Net lease obligation and mortgage debt were reduced by USD 1.7 million in the 3rd quarter. Hedging the Group's interest exposure on bank loan is considered on an ongoing basis. The hedging level of interest rate exposure is currently around 60%. At the end of the 3rd quarter of 2018, the book value per share amounted to NOK 5.07 (USD 0.62), while the equity ratio was 29.6 %. Added value related to the long-term charter party for M/S Belisland is not reflected in the balance sheet. The Capesize-index ended the 3rd quarter at USD 18 350 per day, whereas the Kamsarmax-index ended at USD 15 351 per day. The Supramax-index ended the quarter at USD 13 273 per day. As per today the Cape index stands at USD 18 683 per day, Kamsarmax-index at USD 16 110 per day and Supramax-index at USD 13 319 per day. Baltic S&P Assessment's valuation of a 5-year old Supramax is currently USD 18.5 million. After a slow start due to Chinese holidays, the Supramax market has risen slightly in October. There is more interest for period deals and for Far East delivery fixtures around USD 13-14,000 per day have been reported. Belships' ships are fully covered until February 2019 when M/V Belnippon becomes open. The company is well positioned for a dry bulk market that we believe will be strengthening in 2019-20. Belships' ships are chartered out on fixed rates to reputable counterparts, representing a future nominal gross hire of around USD 38 million. Focus remains to continue developing Belships as an owner and operator of modern bulk carriers to reputable counterparts, building a portfolio of quality ships and robust charter parties that will generate distributable cash flows. In today's (30 October) Extraordinary General Meeting the merger with Lighthouse is expected to be approved. The Board of Directors believes this transaction will be in the best interest of all the shareholders and the company. Following this transaction the combined entity will control a fleet of 16 dry bulk carriers and enhance its earnings potential with a combination of charter backlog and spot exposure. Complementing management activities create a complete in-house operational structure, ideally positioning Belships as a platform for further growth. The company will concentrate on the dry bulk market and expect to benefit from a fully in-house commercial and technical management.